Tokyo - My 18 year-old, four years diabetic Contrary Cat with the sweetest face and the quietest purr! Just like Paris, Tokyo was also born on 6 February 1986 on a bright and sunny day in Auckland, New Zealand. Well she would be really, seeing as they are brother and sister from the same litter of kittens! I was only going to have one kitten, but on the day I went to pick the a kitten up, two little gorgeous bundles were snoozing, head to head, on the back of the couch in the sun, so I ended up going home with two kittens. These kittens became known as Paris and Tokyo. Hey I thought their names were cool, after all I was only just 22 at the time. “Paris” stuck as a name, but “Tokyo” never really did, and she never answered to it. She’s been called Tokes, Tokey Nose, Fatty Boom Sticks, Baby Head, Tatoes, Potato, Poodle - and she never answered to anything. Tatty is a cat’s cat. She’s self-possessed, very intelligent and in her time a formidable hunter. She was always the quieter of the two, and I don’t think she really thinks that much of people on the whole! When they were about four years old we moved to Cambridgeshire in England. The cats spent six months in quarantine, during which time Tatty was treated for an infection which the kennels kindly didn’t tell me about until I was presented with an unexpected bill. Besides that and the normal odd scrape or infection, Tatty was once hit by a car – luckily not badly and she made a full recovery. Incredibly, even though they knew I already had one diabetic at home, I was asked if I wanted to put her to sleep – did they really think I was going to say yes ?!?!?! However, there is a distinct disadvantage to being the second diabetic cat – me. With everything I’d been through with Paris, I thought I’d have Tatty regulated in next to no time. Wrong. My big mistake with Tatty was to assume that she would be exactly the same as her brother, and that she would need the same insulin and the same dose. Wrong, wrong, wrong. When she was first diagnosed I was very blasé about the whole thing, and Tatty promptly got cystitis. This is common in unregulated diabetics, caused by the excess sugar spilling into the urine which alters the chemical balance of the bladder. After a course of antibiotics and a hurried review of her insulin needs, she promptly got cystitis again. And then again. This was probably my first inkling that two diabetics, even though related, can be incredibly different diabetics. I didn’t want her on antibiotics again, so I started looking into alternative treatments for her. So I started her on cranberry tablets, which does the trick nicely. (See the Associated Conditions page for further info) My lovely vet allows me to keep a course of antibiotics at home, should Tatty get a surprise attack of cystitis. In an effort to regulate her, we tried Tatty with Lente insulin, Ultralente insulin, PZI (because Paris was on that one but it turned out to be disastrous for her,) and Unitard insulin before eventually settling on her current one, Caninsulin. Caninsulin is actually for dogs, but that’s “Contrary Mary” Tatty for you. Tatty is one of those cats that it just isn’t possible to regulate. No matter which insulin or which dose, she always ends up with a really high blood sugar level. We even considered going to three shots a day at one stage. So Tatty now gets 1.2 units of Caninsulin insulin twice a day, at 7:30am and 7:00pm. Her blood sugar level is always higher than I would like, but any greater quantity of insulin causes her blood sugar level to plummet, only to bounce right back up again – classic somogyi symptoms. Besides that, my vet and I thought she’d developed a bit of arthritis due to her back legs being a bit stiff. However, a subsequent X-ray and fluid sample from the lump on her hock showed she has no arthritis at all, but an "inconclusive" growth. Given her age I will leave it alone unless it begins to interfere with her lifestyle. Besides this, she’s doing so well. 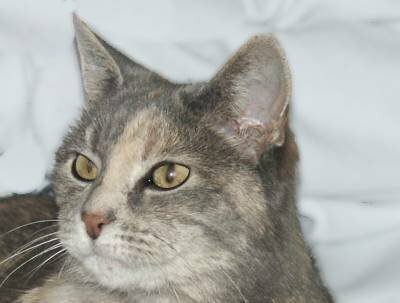 She just turned a magnificent 18 years old on 6 February 2004 – and I was so excited that I completely forgot to give her that morning’s insulin injection. Just goes to show that no matter how long you’ve looked after a diabetic, human nature says you’ll slip up now and again. Of course I panicked all day and she was completely her normal self. She snoozes a lot, has a nice big evening cuddle with me when I get home from work (she’s mellowed towards me in her old age, even after all the blood testing!) she goes and drinks from the pond, because everybody knows pond water tastes better than indoors “tame” water, and she watches birds. She loves TV, particularly snooker, wildlife and cookery programmes – and is very fond of Pixar Animation films like “Finding Nemo” and “Ice Age”. Bless your little furry toes Tatty, you’re a marvel.